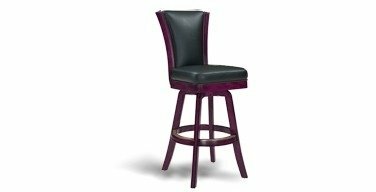 Elite Flex Back Stool looks great with a home bar or at a kitchen counter. The angled arched backrest upholstered in a rich faux black leather, combined with the routered frame detail, makes a very handsome addition to any home. Elite Flex Back Stool is available in a 30 inch seat bar height with metal trim details on the footrest. A complete array of today's most stylish furniture finishes are available. This stool has a great flex feature with flexing in the back of the stool.